Everyone's dream beach house. 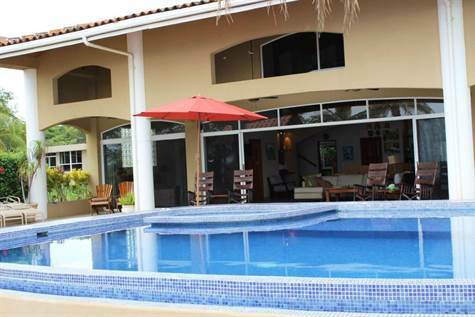 Fully titled oceanfront property with 5 bedrooms and 5 baths designed for enjoying the best Costa Rica has to offer. The Great Room flows out to the large patio and the infinity edge pool then steps onto the sand and ocean. Tropical woods are used throughout the home with soaring 25 ft high ceilings. For entertaining you have seating around a handmade table of local Guanacaste hardwood and a swim up bar. The house comes fully furnished including housewares, tools and 2 kayaks. A modern kitchen with granite counter tops, stainless steel appliances and a breakfast bar that seats 10, is sure to please the cook in the family. A great family home or income producing property. Built as a vacation home to accommodate multiple families and large groups. This desirable home boasts a high rental occupancy rate. Additionally, there are 2 cabins on the back of the property which can be rented or continue as caretakers units.